While it’s true, there are tiny satellite speakers aided by small subwoofers that can be “hidden” in many living spaces, when it comes to great audiophile sound these systems had never delivered … until Cinema. For years now, our award-winning Cinema speakers have been delivering a seamless music and home theatre soundstage that brings movies to life and makes music sound “live.” Also, there is a stand-alone Cinema Sub available to deliver those deeper, dynamic special effects … purpose-built with high SPL’s to support the lower octaves. But that’s not all! Cinema Sub is musical, offers excellent pitch definition, terrific transient response without sacrificing slam and impact. Rumour has it that with this new generation of Cinema speakers, sound may be even better than the movie. Cinema™ 100: Superior S-PAL™ Satin-Anodized Pure-Aluminium Bass/Midrange Cones with advanced motor structures and powerful ceramic / ferrite magnets. The additional mica mineral content stiffened cone composition. 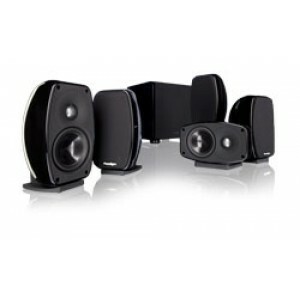 Sound reproduction is particularly detailed providing clear and natural sounding vocals and crisply audible movie dialog. Superior Mineral-Filled Polypropylene Bass Cones with magnet structures tweaked for performance to deliver solid, extended bass performance. Superior S-PAL™ Satin-Anodized Pure-Aluminium Domes with powerful neodymium magnets and ferro-fluid cooling for increased power handling! Highs are transparent with a superb sense of air and exceptional spaciousness. Wire Mesh Tweeter Guard and WaveGuide™ technology ensure a smooth, wide panorama of audiophile-quality sound. Reference quality crossovers in an affordable audiophile … almost unheard of! Driver integration is virtually seamless across the full range of frequencies. Push-thru Binding Posts with Easy-Glide™ Channels.